Former Network Director Sr. Kathy Thornton RSM wrote: “It is perhaps on Capitol Hill that [Catherine] has had the strongest impact, commanding attention with her intelligence and unwavering determination as an advocate for those unduly burdened by the injustices of society. … Catherine has become a formidable presence in the halls of Congress. On December 28, 2017, Sister Catherine Pinkerton, CSJ passed away in Cleveland surrounded by the local CSJ community. Catherine Pinkerton was a sister of St. Joseph for 78 years. 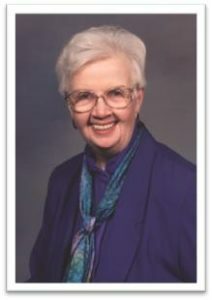 She served as the president of both her congregation and the Leadership Conference of Women Religious (LCWR), was involved in other organizations of women religious, and received the LCWR Outstanding Leadership Award in 2006. As a skilled NETWORK lobbyist for more than 25 years, Catherine traveled the halls of Congress time and time again to speak truth to power. Catherine’s personality and her dedication to working for justice inspired the NETWORK community and earned her the esteem and friendship of political greats. In 2008, Sister Catherine Pinkerton was invited to deliver the benediction at the 2008 Democratic National Convention (watch a video of the benediction). At Catherine’s wake, Sister Simone Campbell reflected on how Catherine’s perseverance and lobbying for comprehensive healthcare reform during the Clinton administration had prepared the way for the Affordable Care Act. Sister Simone shared how happy Catherine was to see it passed just before she retired in 2010. 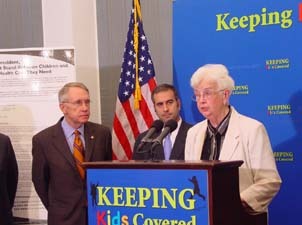 When efforts to craft comprehensive healthcare legislation faltered in the 1990s, Sister Catherine Pinkerton became a passionate advocate for the Child Health Insurance Program (CHIP), which provides health coverage for children in families that earn too much to qualify for Medicaid but not enough to afford health insurance. CHIP was passed in 1997 and has enjoyed bipartisan support since then. Unfortunately, at this moment CHIP lacks any long term federal funding, and states are beginning to prepare for the inevitable end of their CHIP programs if Congress fails to renew funding as quickly as possible. Right now, sixteen states expect to run out of money for CHIP by the end of January. This entry was posted in Front Page, Sister Spirit, Spirit Filled Network on January 3, 2018 by colleen.